Japan is famous for its high-speed bullet trains. The fastest of these is the Hayabusa Shinkansen, which can be found on the Tohoku Shinkansen line in Honshu. An interesting feature of several Tohoku Shinkansen trains is that they offer only reserved seating. This is rare among the shinkansen, so if you wish to travel on this line, be sure to make your reservations early! 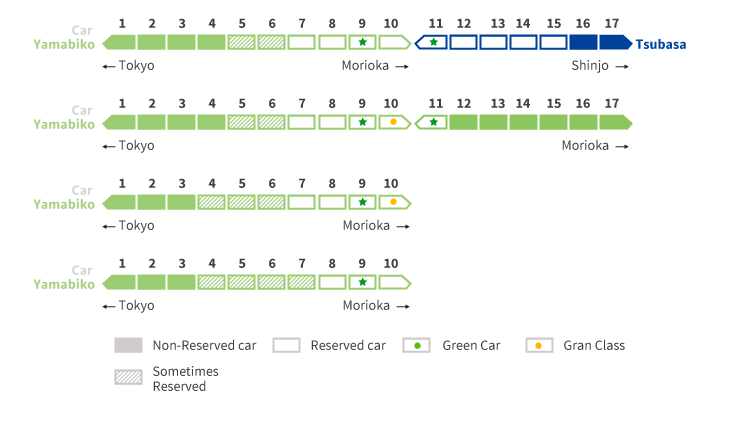 Green cars and gran class cars are available on most trains, as are standing tickets when all seats are booked. This train line has a long history. The first portion of the Tohoku Line opened in 1982, but its services did not reach Aomori until 2010. Today, this shinkansen bullet train line allows access not only to the length of the island of Honshu, but to high-speed train routes to some of Japan’s other islands as well. The Tohoku Shinkansen is the longest Shinkansen line in Japan, stretching 674 kilometers. 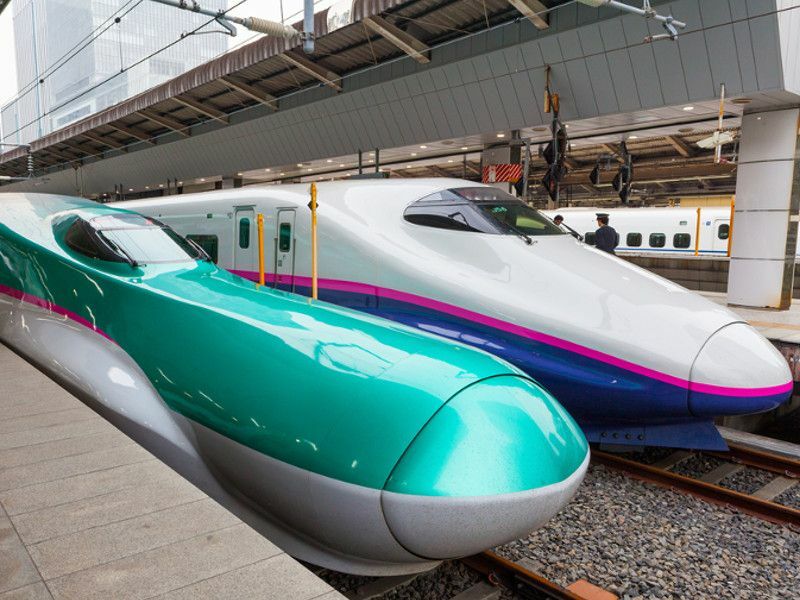 The Tohoku Shinkansen connects cities in the island of Honshu from Tokyo in the south to Aomori in the north. Has two branch lines, the Akita Shinkansen Line and the Yamagata Shinkansen Line. These are sometimes called “mini-shinkansen” because they are narrower and operate on normal railway tracks. The Tohoku Shinkansen also connects to the Hokkaido Shinkansen Line at Shin-Aomori Station in the north via the Seikan Tunnel. This line is scheduled to extend to Sapporo by the year 2030. 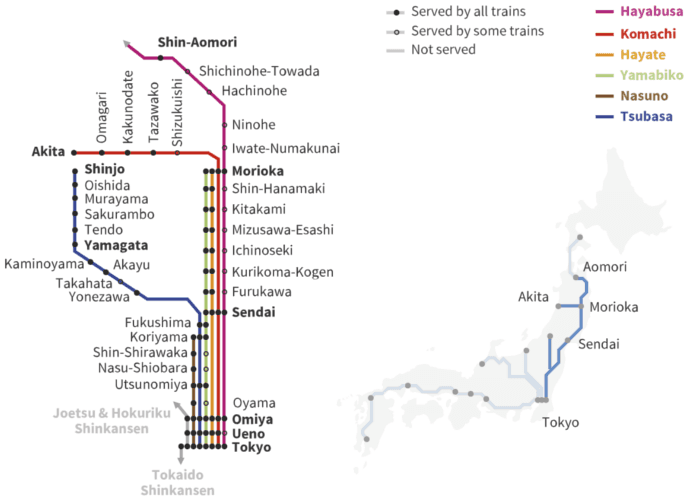 Major stations along the route include Shin-Aomori Station, Morioka Station, Sendai Station, Omiya Station and Tokyo Station. Some, but not all, trains also stop at Shichinohe-Towada, Hachinohe, Ninohe, Iwate-Numakunai, Shin-Hanamaki, Kitakami, Mizusawa-Esashi, Ichinoseki, Kurikoma-Kogen, Furukawa, Shiroishi-Zao, Fukushima, Koriyama, Shin-Shirakawa, Nasu-Shiobara, Utsunomiya, Oyama and Ueno Stations. Tohoku Shinkansen Line Map with Akita and Yamagata Shinkansen branches. Five types of trains operate on the Tohoku Shinkansen Line: Hayabusa, Hayate, Yamabiko and Komachi. Hayabusa Shinkansen is the fastest train in Tohoku Shinkansen Line, which travels at speeds of up to 320 kilometers per hour. Hayabusa trains stop only at major train stations along the route. Some Hayabusa trains continue past Shin-Aomori Station into Hokkaido. The Hayabusa contains no non-reserved seating. When all the seats are full, standing tickets are made available. Hayate trains run between Tokyo and Morioka, bypassing all stations between Sendai and Omiya. Hayate trains also have only reserved seating, with standing tickets available when all seats are booked. Yamabiko trains travel from Tokyo to Morioka and Sendai in the north and offer non-reserved seating. Nasuno trains stop at all stations between Koriyama and Tokyo, making them the slowest on the line. Komachi trains are coupled to Hayabusa trains when traveling between Tokyo and Morioka. At Morioka, they are uncoupled and operate independently on the Akita Shinkansen Line. Komachi trains also have only reserved seating. Similarly, the Tsubasa Shinkansen trains are coupled to Yamabiko trains between Tokyo and Fukushima. They then operate independently along the Yamagata Shinkansen Line. Your Japan Rail Pass is valid on all trains of the Tohoku Shinkansen Line. You can activate your JR Pass at the ticketing counter of any major train station. Be sure to visit the ticketing counters to book reserved seating as well. Be ready to present your JR Pass at the departure gate. From Tokyo Station, take the Hayabusa Shinkansen to Sendai Station, a trip of about an hour and a half. Alternatively, you may take the Komachi train of the Akita Shinkansen line from Tokyo Station to Sendai Station, a trip of about 1 hour and 45 minutes. Sendai is the largest city in the Tohoku Region, and one of the 15 largest in Japan. This modern city is also a historic one, having been founded around the year 1600. Many historic attractions are linked to the city’s founder, the powerful feudal lord Date Masamune. Less than an hour to the northeast of Sendai lie the islands of Matsushima Bay, considered one of the three most scenic places in Japan. Take the Tohoku Line’s Yamabiko train from Tokyo Station to Fukushima Station. This trip will take about two hours. While in the Tohoku Region’s capital city, you can explore the Azuma mountain range, enjoy natural hot springs, or take in the spring cherry blossoms of the rural neighborhood of Hanamiyama. With this helpful guide, you are ready to use your JR Pass to explore beautiful Honshu. Start planning your next adventure today! I actually appreciate your content. The comment has genuinely peaks my interest. I’m going to subscribe your channel and maintain checking for new details. This insight really help. I am looking for some good blog sites for good info. I was searching over search engines and found your educational Channel. Well i like your high quality comment analysis plus your broadcasting abilities. Good Article!